We’re tackling unified communications (UC) to help our readers navigate what UC platform is the best fit for their organization. Previously, we dissected Rogers Unison and Mitel Networks. For our third installment of Unpacking UC, we’re diving into Cisco Systems Canada. Cisco has made a name for itself with over a decade of experience in UC. Its Unified Communications Manager, the combination of voice, video, telepresence, messaging, presence, and conferencing, has been the company’s backbone. Additions such as WebEx for web conferencing and Collaboration Meeting Rooms (CMR) Cloud for cloud-based video conferencing have bolstered the Cisco portfolio over the years. But in 2017, when you think of Cisco UC, you’ll be thinking of Cisco Spark, the company’s next generation UC-as-a-Service solution. When it comes to UC, Cisco’s mission statement is simple: Put ‘No-compromise’ collaboration into every room, desk, and pocket. Cisco Spark is the product of that mission. At its core, Spark offers business messaging, meeting, and call capabilities, and is integrated with CMR Cloud and WebEx. The acquisition of Acano over a year ago brings video scale and interoperability to the platform as well. “Cisco Spark is our next generation platform. It’s what we are evolving towards. Spark is a bunch of things. It is a client for video and collaboration, but also for call control. It is our next generation environment,” said Ted Schirk, Cisco Canada’s head of UC and collaboration practice. ITWC spoke with Schirk and Cisco Canada’s general manager of collaboration, Keith De Abreu, for further insight into Cisco’s offerings. But as Spark continues to gain momentum moving forward in the cloud, Cisco isn’t leaving anything behind. Cisco’s UC solutions are available on-premises, in the cloud, or as a hybrid option through its channel partners. “We’re finding when we do renewals now that customers are buying 80 per cent, 75 per cent, of the number of phones. So it’s important that we talk about the core element that is still people talking on their phone every day. It’s not going away anytime soon,” said De Abreu. Whether or not a business aims to move to the cloud, stay on-premises, or go for a hybrid option, Cisco’s goal is to deliver a UC product that can be used either way. For example, Schirk mentions the ability to start a meeting on your smartphone if you’re running late to your office or to a meeting room, and then switch to a desktop or connected monitor without any interruptions when you arrive. This is done through a new tech Cisco is calling Proximity, which removes the gaggle of wires and dongles that usually inhabit meeting rooms. Cisco Spark supports open APIs and SDKs as well. Additionally, Cisco recently announced a partnership with Apple to optimize WiFi connectivity. However, the true benefit of the partnership is the fact that iOS and Cisco devices can now recognize each other automatically. 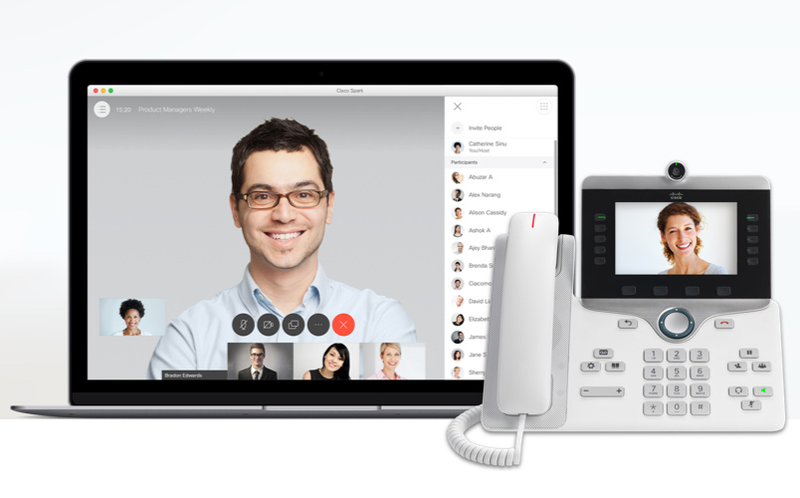 Cisco Spark Hybrid Services: Includes Hybrid Call Service, which connects the Unified Communications Manager, Business Edition 6000 and 7000, and the Hosted Collaboration Solution with Cisco Spark Message; Hybrid Calendar Service, allowing for integration with Microsoft Exchange/Outlook; Hybrid Directory Service, connecting Spark with Active Directory; and Hybrid Media Service, which provides a local instance of media processing for Spark meetings on customer premises for lower latency. Cisco Spark Meetings: Takes the meeting functionality from WebEx and extends it into the time before and after the meeting. Everyone involved with a meeting can view and share files and whiteboards. Up to 25 users can take part in a meeting at a time. Meetings is linked with the Spark message space. Cisco Spark Messaging: A mobile-first messaging experience center on secure virtual spaces for individual and group interactions. Users can send messages, share files, and integrate with other available tools. End-to-end encryption secures all messages and files sent within the application. 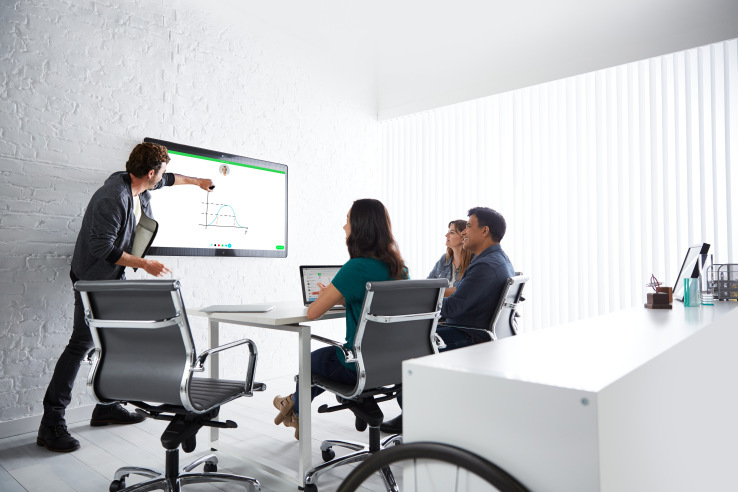 Cisco Smart Board: The company’s new all-in-one meeting room device built around the Spark platform meant to replace whiteboards, prompters, etc. It can be controlled by a smartphone, tablet, PC, or any device that has the Spark platform on it. Available in 55 and 70 inch sizes, and features a touchscreen and 4K cameras. Cisco doesn’t sell its offerings directly, choosing to rely on its partner community instead. There are three Spark bundles to choose from. Spark Business: $10.40 per month. Included features are business messaging, file sharing, video calls with 3 participants and screen sharing, moderation controls, synchronize with calendars and contacts such as Outlook, integration with other business tools and software, and single sign on and integration with security encryption for messages and shared documents. Spark Enhanced: $16.90 per month. Adds video calling for up to 25 participants and screen sharing. Spark Premium: $37.70 per month. Adds video calling for up to 200 participants and screen sharing, and WebEx. You can also add different features individually to each bundle for set prices. For more, click here. Throughout the Unpacking UC series, we’ll be working with Fox Group chief innovation officer Roberta Fox to help us with further analysis. Since Cisco has so many different offerings, Fox puts emphasis on the fact that customers when looking at Cisco, should figure out exactly what they need so they don’t go overboard with features that might not be used. Roberta Fox is providing in-depth analysis for our Unpacking UC series. 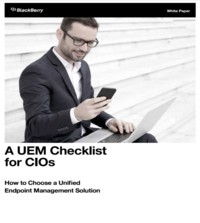 “It is really important in UC to understand and define the business requirements. It doesn’t matter whose solution, you don’t want to buy licenses that aren’t going to be used,” Fox said. Fox dials in on two aspects of the Cisco business when analyzing their current offerings: the Cisco networking power, and its broad channel base. Considering Cisco doesn’t sell direct, a broad channel base is exactly what potential customers would want to hear. Cisco has put a significant effort into their channel, including education opportunities. 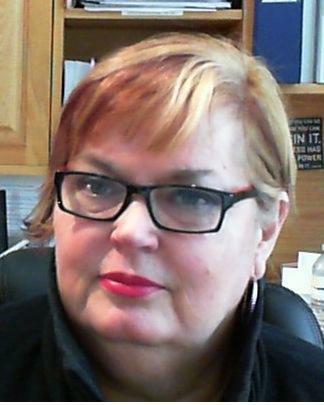 “They’re partners are very knowledgeable. Through opportunities like Cisco University, their channel partners are probably some of the most knowledgeable about what UC can do for you. They’ve put a lot of investment on channel education,” said Fox. Next up, we’re Unpacking UC with a deep dive into Microsoft’s portfolio.